Carbs 'n' Coffee, the road beckons. 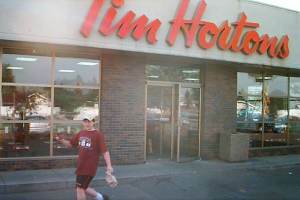 The digicam was lost until this morning when it turned up in some obscure corner of someone's luggage, so that the documentation of the family's summer vacation ends up as a vignette of them straggling out of a Tim's in Leduc, Alberta. I tried to make the best of a bad situation by offering to take photos of other patrons as they emerged, cup in hand. You know, like the little entrepreneurships which thrive around mall Santas and other shrines. It didn't work, and the family rescued me just before the fellows in the white coats got there.